Welcome to Conshohocken United Methodist Church! People often describe our worship style as casual, contemporary, and engaging. At CUMC, our doors are open to all, offering a relaxed, enjoyable atmosphere with modern Christian music and a Bible message that’s relatable to everyday life. We hope to see you on Sunday morning, or at one of our upcoming events, to see what we are all about. Our mission is to be open and accessible to all, no matter what your background, past life or present situation so everyone can experience God's love and grace. We hope that by visiting with us, you’ll experience something special in the love, hope and grace of Christ. 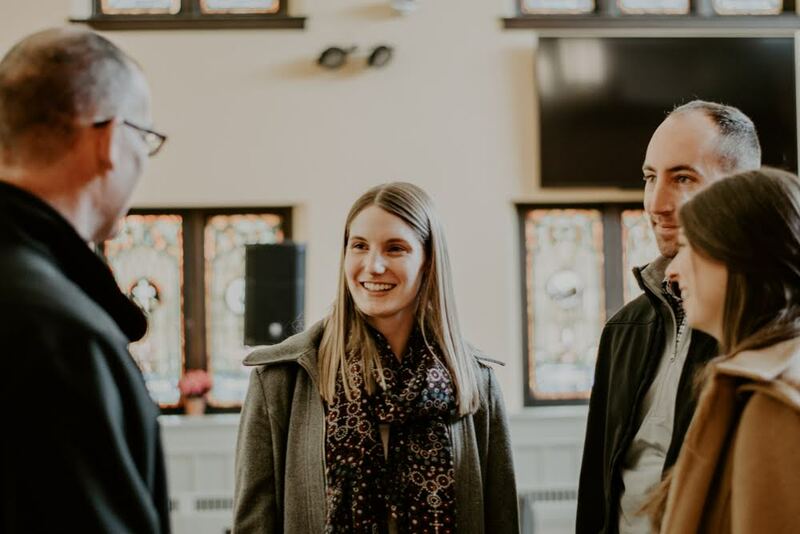 Whether you’re someone who’s gone to church all your life or are just starting to ask questions about God, we welcome you here at Conshy United. We are a casual church. Come as you are. You’ll see people in a variety of attire that’s comfortable to them, from sports gear and jeans to business casual, dress however you like. If you are visiting us for the first time, you will be greeted by someone at the door with a bulletin and they can answer any questions you may have. Our greeters are stationed inside most of the doors to the church facility. Relax and get comfortable as music and the service begins. If you arrive early feel free to wander into the café on the far side of the sanctuary for a cup of coffee and snack. After the service visit our welcome center in the main entrance and receive a special welcome gift. Our church is located on the corner of 6th Avenue and Fayette Street in Conshohocken. Two large red doors mark our main entrance on Fayette Street. An additional entrance is located on 6th Avenue, but the use of stairs is required to reach the worship area. Additionally, there is a handicap entrance on Fayette Street that faces Sovereign Bank. If you need assistance entering the handicap entrance ask one of our greeters. Street parking is available on 6th Avenue, as well as on Fayette Street. On Sundays, additional parking is available at Continental Bank and Sovereign Bank. Both banks are located on Fayette Street, to the right and left of our property. Does CUMC offer easy wheel chair/handicap access? Yes, wheelchair access is available from Fayette Street. This additional entrance faces Sovereign Bank and is located at the front of our property. What is the format of a typical Sunday worship service at CUMC? Every worship service features contemporary music, prayer and a sermon in a casual “come as you are” setting that we hope will help you feel the love and grace of Jesus Christ. Does CUMC offer Holy Communion? Holy Communion is offered at the first worship service of each month. All in attendance are invited to share in the body and blood of Christ, regardless of age or denomination. Sunday School for kids (kindergarten to 5th grade) is held at 9 am every Sunday. The classroom is located on the far side of Jillian’s Café with double doors marked “Sunday School”. Our nursery is open during our 10 am worship service and staffed by clearenced volunteers and staff. During the service, bags of crayons and coloring books are available for young ones at the back of the church.